Fantasticat wishes to you and yours (that means your 4-legged friends too!) for a meowvalous and absolutacat PURRfect and non CATastrophic 2008! Tis the season to get wrapped up in wrapping! The tree is trimmed and I've only toppled it once! Hey , that's not bad for a kitten who's just 18 months. Oh Dancer and Prancer, please head to my house - my stocking is ready for a nice plump mouse. 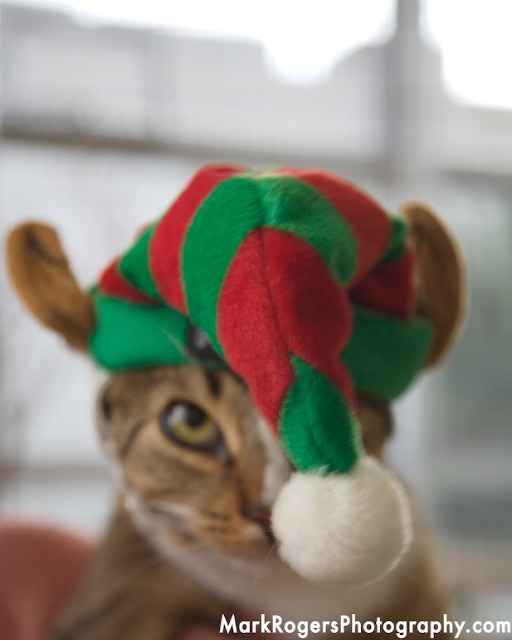 Tis the season to be jolly or is it time for feline folly? 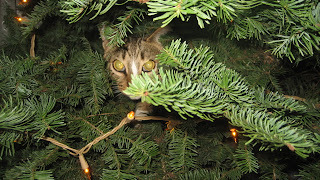 My pawsatively busy paws are making Holly Days progress and I've managed to get the tree up. Whew and mew.... it was a little CATastrophic to check out each limb, but being the PURRfectionist I am, it was necessicat to assure my tree is safe for me. 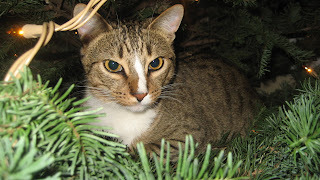 What to look for in a tree: full and fresh, strong and comfy so I went out on a very high limb and tested resting - abundacat catnaps upon the limbs is the pawsatively sure way to know if the tree and I are compaticats for the season. 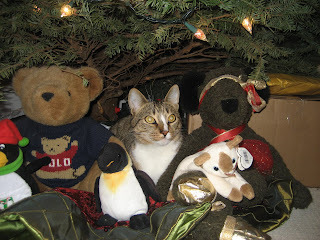 Five paws up for this Noble Fir (oops Noble Fur) and catzowey it's got gold lights that warm my smitten kitten whiskers. Whatever jingles your bells, make sure your tree is comfy and cozy! Catzowey.... My mighty meowster self wishes you a Happy Hannukah if you're celebraCATing on Dec 4th and here's to the 22 days till Santa arrives to pick up this hat! Everyone loves Thanksgiving: the time to travel while despurrately trying not to unravel. Even a smitten kitten gets into the cornocopiacat mode at this time of year when catnaps in the furgotten sun rays seem to be none existent. So, being the good independacat I am, I packed my kitty couture for my week-with-the -Turkey trip consisting of 4 days of cat-cultural events , equal amounts of full tables and cat naps. But I couldn't get my suitcase closed with ease. So paused my paws and got into a Zen Cat moment, and it worked! Suitcase closed with my clothes and I'm off to the airport. When I got to the airport,they announce over and over, to stay with your bag and never leave it unattended.... so I sat on my bag for security PURRposes and I almost missed my feline flight cuz I sat so long. Catzowey it's a suffering succotash moment for the Mighty Meowster and this self instructed electronicat check-in stuff doesn't work well with my 4 paws. What ever happened to full service check in? Oh by the way - are you wondering where I'm headed?? To Washington DC to meet that Turkey that got pardoned at the White House as he may want to dine with me, the Italian Kitty. Who ever said traveling was easy?But if you want your Turkey, Turkduckin, Tofurkin or traditional Thanksgiving Tuna Tartare, it's worth it! Hope your Thanksgiving was PURRfect. My dinner partner does the Turkey Trot soI've donned feline feathers to strut "the smitten kitten step". DefiniCATley I'm a non -razzled fuzzy feathered friend of the Turkey and don't call me a peasant pheasant! Wishing you and yours a nonCATastrophic Thanksgiving week! 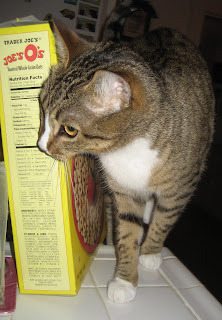 This week's moxey meowster lesson: read and heed the Nutrition Box ... Joe's O's are catzowey cuz they insist "they're sure to bring out the kid inside of you"! Playtime begins my day - the box has a catzillion healthy O's for a pawsatively healthy hockey game on your kitchen floor. These whole wheat natural O's have no artificial coloring so my paws are safe while my goals are great. I'd say they're politiCATically good for you too. Bye bye breakfast, and nobody is going to get their paws into my O's box. So in true Brit form, Tally Ho and Cheerio! 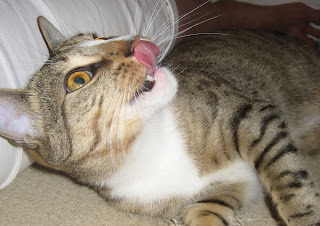 Joe's O's are whisker licking good! 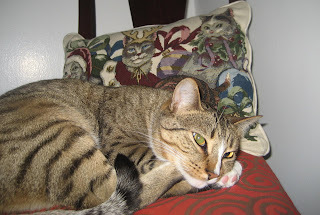 We fastidious felines are comfy creatures of habit - oh my purrs, a time change puts my feeding habits into a frantic feline fury not to mention the lack of abundacat sun rays for catnaps du giorno - what's a kitty to do? Cross my paws for a PURRfect Day to spring forward soon. Have a nonCATastrophic happy Halloween! Lights, camera, action and paws up! That's what echoed in my smitten kitten ears this week during my first feline modeling assignment - a catzowey professional shoot. Chill your whiskers folks, this mighty meowster was photographed by the creme de la creme (and I'm not talking fat free or low fat but the real stuff!) of animal photographers - the infamous (and feline friendly) Mark Rogers who can capture the flicker of a whisker at a pawsatively purrfect moment, even from an Italian Kitty. Mark and I had buddy bonding on the set and he now knows which is my best side, but is it purrposterous to think his camera lens is longer than the mighty meowster? Four Paws Up and proof that the guy has a creatacative eye - of course I have 2 big ones that may land me in a coffee table book: PURRportedly a purrfectly wonderful collection of how cats live luxuriously (is there any other way?). So stay tuned to see if my feline portfolio makes the Publisher purr and takes you to a Borders book shelf to buy buy buy. 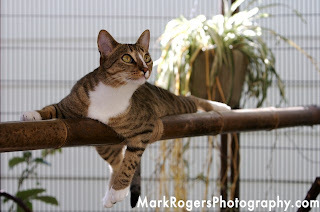 Catch abundacat pics on Mark's website and more pics of me and his candid canine shots too. PS - Do you know someone who wants to start their day The Guido Way? 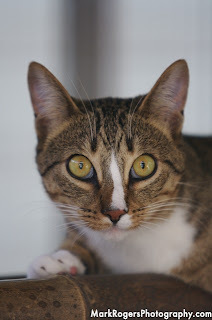 It's meowvalous, it's PURRfect and it's where my paws ventured to this weekend: yes out of my cat condo digs and over to Pet Camp Cat Safari which is quite the PURRfect ahhhminous experience for my big tiger cat eyes to behold! Meowsters unite - let's give this great new addition to our City a 4-Paws Up as its stellar-cat-service was unthinkable for this mighty meowster who was greeted and meeted to the max. CATch me here with the omniscient Owner Virginia, (she cat chats well). Definitely our "let's get cat-acquainted" interview was an enduring and purring experience. Thought I was proPURRly checked IN but I was probably checked OUT simultanakitteously as the attendants seem to think I'm a dapper kind of guy, but hey I'm an Italian kitty - sleek suave stripes get ya an upgrade! Check in was feline-non-finicky (a breeze) and I was off to the Safari room - an incredukitty experience with enthusiasticat live green jungle plants, and crickets piped in everywhere to wiggle my whiskers, high wire bamboo walking (I excelled), tree climbing for my tootsies that have only pounced on condo carpeting, and ah ha... birds birds and more birds chirping from every wild direction - well need I tell you I had a Tom Cat Time and I think I became a cat! Once out of the jungle safari garden, I went fishing. They don't offer Hook & Release but it's all envirocatically correct and Pet Camp Cat Safari is all Green - not as in kitty grass but as in politicatically correct. It's a kindred catzowey experience! 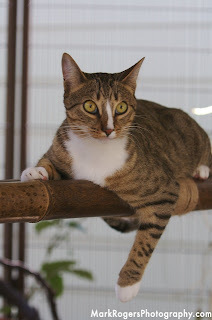 Get all 4 of your paws on over for a kitty safari at Pet Camp Cat Safari (3233 Sacramento Street in The City By The Bay) ...where else would this be?? 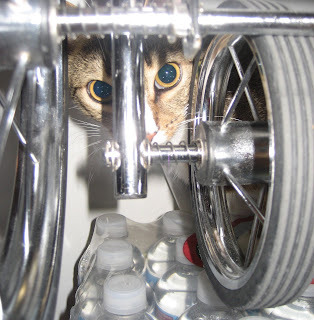 It's the PURRfect play date place and you might get your whiskers wiggled. Last week I had airtime (CBS news) and this week I'm still doing airtime: FURgot to tell ya I flew with the Blue Angels. Let's talk about bird watching from the wild and very blue skies above while cat-cruising around at speeds beyond this mighty meowster's wildest whiskers imagination. The G-Forces practically took off my stripes! I'm jolted from my PURRfect catnap by some colorful Fall creatures. Hey dudes, who invited you?? 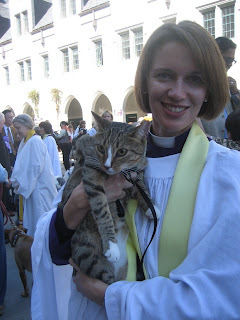 I'm in ecstaticat mode and my paws have not touched the ground yet, because Sunday at Grace Cathedral, my baby bengal self was cradled and blessed by Jane Goodall - the renowned primatologist and I behaved PURRfectly! 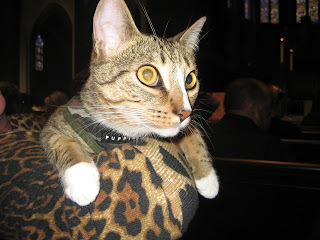 I wasn't going to miss St. Francis day and the blessing of we furried and some feathered pals (yep and a few scaley dudes too)- so off I went (well, I actually got carried wearing an escape proof pup harnass - a Dolce Catbana - but it was camouflage design and cool!). Jane picked me out of a crowd of canines - lucky me and catzowey - she has the magic touch for head massage. I'm thinking of reloCATing closer to her - she's magical and has a Meowvalous message for all of you 2-leggeds. Being a bit leary when the organ began, I felt secure holding on to my tale - I'd once heard a story about Tails in the Crypt and didn't want to become one of those victims. Hey, this Grace CAThedral is some place( it has a catwalk and colorful windows for heavenly bird watching). 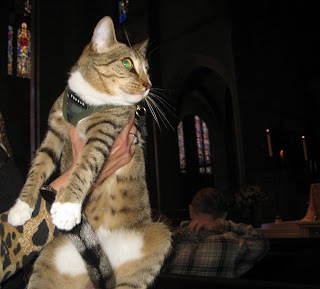 Would you believe there were 900 folks and their pets in and on the Pews (my pew mate was a golden lab who was aMEWsed by my stripes). 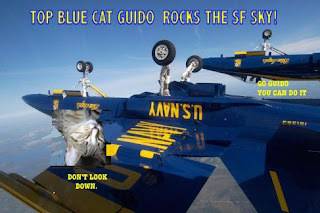 9 out of 10 pew seated folks asked my momma what breed I was and a zillion catzillion of times I heard her decry "GUIDO is pure-bred San Francisco SPCA" - nobody ever believed her - they catsistantly insisted I was some fancy shmancy meowster. Whatsa matta with them? Good things come to those with 4-paws: I actually got blessed again - when the dazzling Rev. Vanessa Glass held me and whispered a sweet prayer into my fuzzy Episcocat ears. She's an angelicat. And who might have had their debut onCBS affiliate evening news on Sunday eve? Not just once, but twice - after all some fat cats aren't home for the 6:30pm news and others are seriously catnapping at 11pm. I made both newscasts - woo hoo so watch carefully (click above on CBS link) and when you see 2 white poodle dogs, the mighty meowster is seconds shortly thereafter. Fashion week in New York produces meowvalous catour and my whiskers flicker over my fellow Italian designer, Salvatore Feral-cat-gamo - oh Puuuurrrrr, his threads are sleek & hug any bod. Definicately feline form fitting and tom cat terrific - and snug fit makes me feel like a 'roll over Beethoven rockstar'. And my next favorite feline fiber, being the politicatically correct meowster I am, I opted for the krinkly linen look - just imagine something I'd been catnapping on all day long. I'm the enviro-kitty and love PURRfectly 100% organicatically natural fibers. This terrific tissue suit can later be shredded for play - now that is what I call remarkable recycling! Arriverderci Summer, translates to my meowster self no longer slumbering in abundacat summer sun-rays. But behold - meowvalous miracles are on the horizon for this Fall season, and I'm not talking reality TV, like Prancing With The Stars or DesPURRat Housewives! Consider this convivial cat chat announcing the arrival of the chokes! Catzowey it's artichoke season - and beyond any cat's 9 lives, the spindly critters (which come from CATStroville California) could become a natural & politicatically correct weapon for our nation if targeted proPURRly. They roll and you could probably bowl a PURRfect strike with one. Oh yeah, ya might have a catastrophic moment in peeling the spiney leaves, definicatly - so be sure tp protect your delicat paws while trying to grab and not be stabbed. Chokes are everywhere now -not just in the market. See for yourself this out of control veggie du giorno nearly flattened me, your favorito Italian Kitty. My whiskers winced, I was silenced and it jolted me and my Italian 'tude' from a day-long catnap! Hummm, humbled by a run-a-way artichoke? Eoww and Meow! I don't recommend pouncing on a run-a-way artichoke that's in roll and bowl mode! What else to do but join the Choke Patrol.My kitty crystal ball says "This mighty meowster will issue citations to any meowlicious out-of-control artichokes who disturb my pawsatively purrfect catnaps". Ciao & Meow and don't let your artichokes take control of you! Catzowey it's Heirloom tomato season and things are popping up red and ruby deliciouscatly. PURRhaps you ponder over how to choose the right ripe tomato, well follow my paws in this seasonly sensational safari. The awe-roma of the big reds is scentsational and it's not recommended you attempt tomato tasting without being eye level to the goods. Paws down you'll know when you've found the Heirloom that will make you purr and it only takes 1 to make your meal a delicat experience. No fried green tomatoes in site for this mighty meowster but I might make a pot of fresh tomato CATsup with my favorite fat Heirloom. The inimitable Luciano Pavarotti delivered meowvalous PURRformances and in honor of his departing this world, I PAWsed from my catzowey schedule to revel in a larger-than-life sun ray to experience a moment of silence (that doesn't happen often in my house!) paying tribute to my fantasticat fellow Italian. Opera season has launched, so I've got my black and white tux dusted off, de-fuzzed and ready to go. 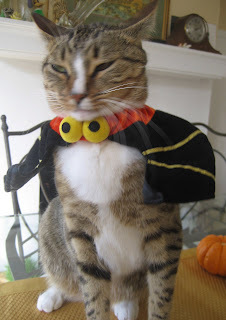 This year I'm wearing the collarless look - hey guys, don't you Tom cats remember the Nehru jacket? My smitten kitten designer dude-self is feeling frisky this Opera season, and my paws are ready for a season of awesome arias - PURRhaps Madama Butterfly would be appropricat for me with my adoration for things that flutter and fly. Wishing you and your paws a nonCATastrophic week filled with sun rays and maybe a catnap too! Fluoride loving feline that I am, (no I don't brush -but I do floss with all natural and very fresh grass blades) there is nothing this mighty meowster loves more, than to include good organicat greens in my daily diet. That's me and my home grown wheat grass crop. You can imagine my ears perked and my whiskers stood on point when I got wind of September 2nd being the 40th Anniversary (catzowicans - that's 280 years in kitty years!) 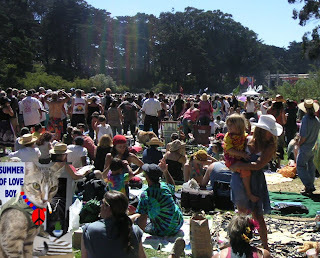 of The Summer of Love, and it was going to be happening in my City by the Bay. For weeks the papers clearly announced 'free grass would be everywhere' .... So my paws pranced over to Golden Gate Park on Sunday ....oh my, oh my, OH my - my smitten kitten eyes had a big surprise! No Tye Dye in my cat-closet, so I wore my natural stripes with my jungle jacket, and donned a Peace necklace and my poster - I Just wanted to meld in naturally, and some folks were in really natural modes. Yep, the press was right on: grass was everywhere (but not my organic healthy wheat grass) and versatile too: to sit and picnic on, to roll around on, to groove to the meowvalous music on, to indulge in. Click on this photo to see me up-close and PURRsonal. 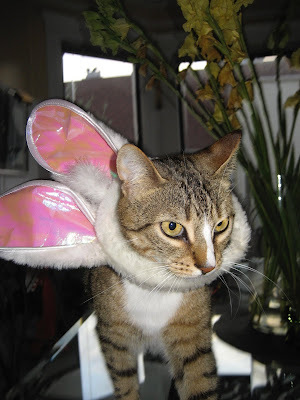 Feline frustrations - I just tried to fit in PURRfectly incatnito, at The Summer of Love. My kitty consensus is I preFUR my organic kitty wheat grass from my local North Beach Pet Shop. Peace, Love & Organic Wheat Grass Blessings!